We can’t rely on drivers to keep their eyes on the road, so officials with the National Highway Traffic Safety Administration (NHTSA) are turning to auto manufacturers for help. In a recent announcement from Ray LaHood, Secretary with the U.S. Department of Transportation, new guidelines have been released to help to minimize the possible in-car, electronic distractions for drivers. Included in these distractions are navigation, communication and entertainment devices. “Distracted driving is a deadly epidemic that has devastating consequences on our nation’s roadways,” said Secretary LaHood. Our Quincy car accident lawyers understand that the gadgets make the vehicle. Consumers are looking for vehicles with all the bells and whistles. Unfortunately, those bells and whistles come with some serious risks for car accidents. Today, newer vehicles come equipped with in-car phones, text messaging devices, email checking services, web browsing devices and even interactive navigation units. While that might make a vehicle more appealing to drive, it also makes it more dangerous. That’s why NHTSA officials are proposing voluntary guidelines for car manufacturers to put an end to these devices — or to at least disable them while the vehicle is in motion. Falling under these new guidelines are the devices that require a driver to take their eyes off the road of their hands off the wheel. As it stands now, only drivers under the age of 18 in the state of Massachusetts are prohibited from using a hand-held cell phone in the driver’s seat. All drivers in the state have been banned from text messaging at the wheel, according to the Insurance Institute for Highway Safety (IIHS). 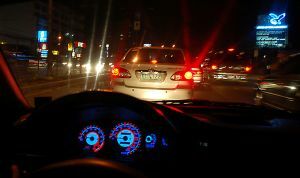 The Safe Driving Law signed by Governor Patrick became effective on September 30, 2010. Among other provisions, the law bans sending, typing or reading electronic messages to or from handheld devices while operating a motor vehicle. This includes use of the internet and text messaging. While that may be the law, drivers are still engaging in these activities because the services are so readily available in their vehicle. It’s a serious problem and we need to do something about it now. According to Distraction.gov, there were close to 3,500 people killed in car accidents in the U.S. because of someone’s distracted driving habits. That’s an increase from the year before — proving the problem is only getting worse. In addition to these fatalities, there were also more than 385,000 injuries recorded throughout the year because of these same irresponsible driving habits. As a matter of fact, close to 20 percent of injury crashes in 2010 were reported as distraction-affected crashes. While these devices may be here to stay in our vehicles, it doesn’t mean we have to use them — especially when driving. There’s a time and a place for everything, and behind the wheel is no time to make calls, check texts or deal with email. Make sure that you’ve come to a complete stop and your vehicle is in “park” before attending to these activities — lives depend on it. Will a Driverless Car Make Car Accidents a Thing of the Past?